Do you feel like you are walking on an electric current? Does standing on both feet for an extended period hurt? A good foot examination allows finding the source of the problem. Pain in your forefoot can often be controlled by wearing an orthosis or a shoe adjusted to minimize contact points (callosity, corns). 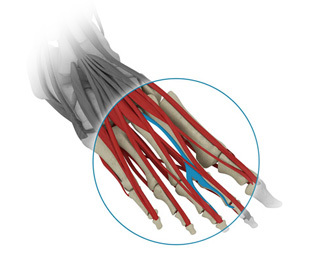 When a plantar nerve is pinched when loaded (Morton's neuroma), it may require surgical decompression (Morton's neuroma excision).